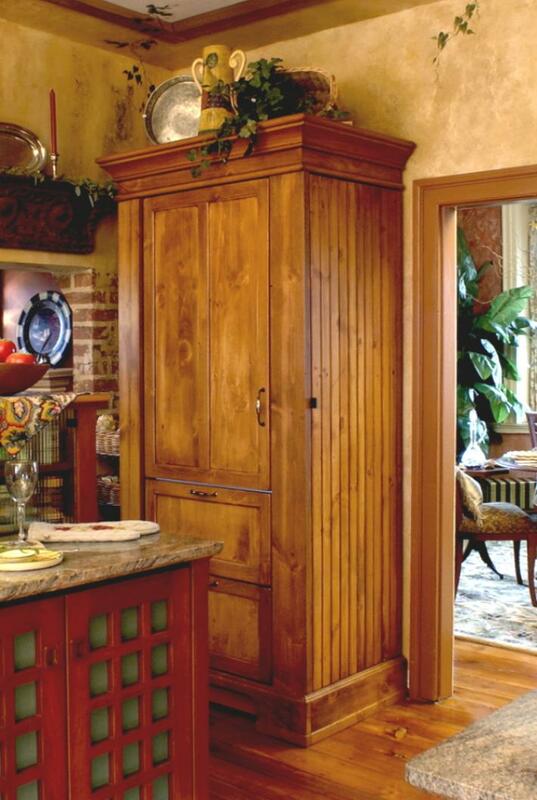 Because our armoire refrigerator workstations always have the front and two sides exposed, we have designed many storage options that flank our full height refrigerators. This helps to eliminate the need for upper wall hung cabinets and allows all of the dry goods and cold storage to be located in one piece. 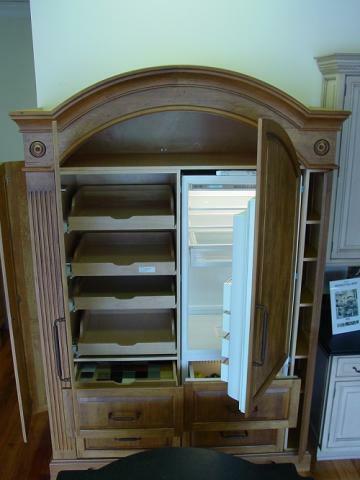 Below is another freestanding Armoire refrigerator that includes a Subzero 700 refrigerator flanked by a 700 freezer. 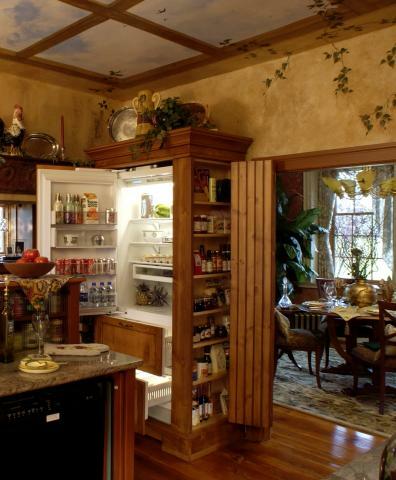 One can deep pantries flank each appliance. The owners of the unfitted piece below decided to keep their existing refrigerator and surround it with flanking pantries, the left one has roll-out shelving accessed from the front and the right one has a bifold doors on the side that reveals 12″ deep shelving. The grille above the refrigerator opens to reveal more storage. This piece can accommodate a GE Profile wood paneled refrigerator in the future. 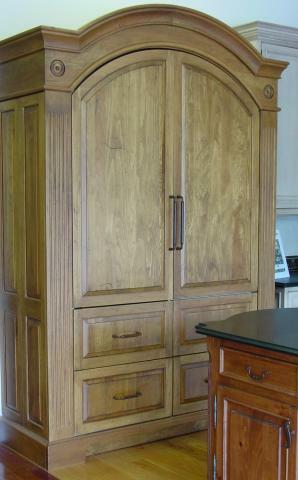 Below, a kitchen and bath showroom has a distressed pine SZ15-RP-54 Refrigerator Armoire on display that features a 15 CF Subzero 700 refrigerator, a full height pantry next to the Subzero, a flanking one-can-deep pantry on the left with side opening doors and a 6″ wide front opening pantry on the right. 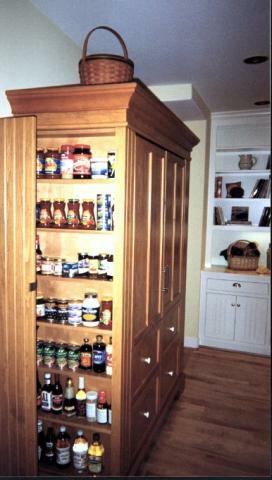 The flanking pantries are available as 14″ wide/deep units as well. Above, the arch top allows for a lot of extra storage. This piece can become a great focal point for most kitchens consisting of only a few workstations. 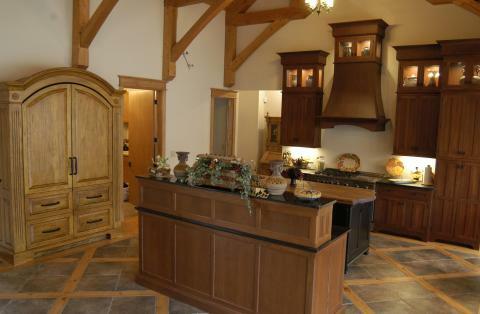 Another arched top refrigerator/pantry armoire and an island sink unit is used in this Great Room (below) that includes custom designed cabinetry. 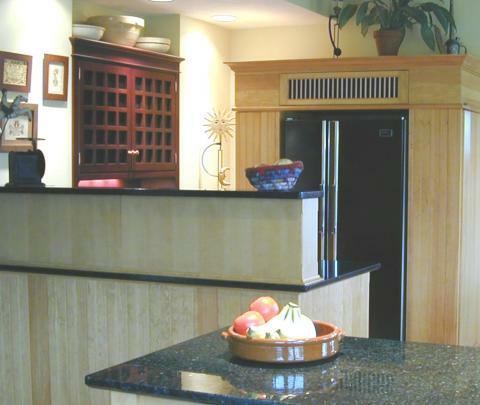 The unfitted furniture concept allows for diversity that is impossible to acheive with wall to wall cabinetry.